In the spring 2003, kids, parents, teachers, librarians--whole communities--discovered and fell in love with Jeanne DuPrau's story about a doomed city, and the two children who found a way out. Nearly 10 years later, that story, The City of Ember, is a bona fide classic, with over 1.7 million copies sold. Now experience Jeanne DuPrau's vision anew as artist Niklas Asker faithfully brings to life the glare of the lamps, the dinginess of the streets, and the brilliance of the first sunrise. JEANNE DUPRAU is the New York Times bestselling author of the Books of Ember series. 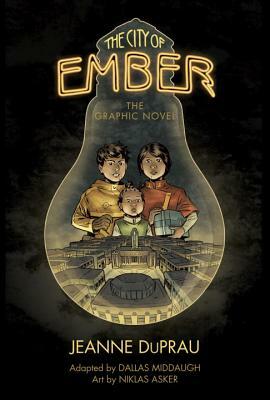 "The city of Ember, the only light in a vast world of darkness, is dying and two young teens might be the only ones who can find the way out of their darkening town--if they can escape the machinations of a corrupt mayor. DuPrau's well-received dystopian and postapocalyptic middle-grade novel is ably adapted into graphic-novel form by Middaugh and Asker. The result is a streamlined work that moves quickly while retaining the heart of the original story. Readers new and old will appreciate the muted colors of Asker's artwork, which clearly shows the dinginess of Ember and the generic quality of people who have bred past specific races." "Effective use of light and shadow in the art give this graphic adaptation of the 2003 novel a properly spooky look. The tale is told in a visual, cinematic way with an admixture of quick reaction shots and wordless action sequences that allow readers to race along almost as fast as they can turn the pages. Asker's penumbral scenes underground and broad, grassy Eden above are strongly atmospheric and depict both settings and the clearly delineated cast (particularly the grossly corpulent Mayor) in tellingly crisp detail."